Block and draw dominoes is one of the easiest ways to start off playing dominoes and for this reason, many people are often introduced to it as a child. It’s a great game for outlining the basic plays in dominoes and if you start learning the rules in this way, you’ll be able to play a variety of dominoes in no time at all. In order to play block and draw, you must have a normal set of double six dominoes. This is a set with 28 tiles in it – a tile refers to one individual domino piece. Ideally the game should have between 2 and 5 players and usually lasts around 30 minutes or more. You should start off by placing all the tiles face down on the playing surface and give them a good shuffle. Each player then takes a certain number of tiles – two or three players take 7, four or five players take 5. All the remaining dominoes are moved to the side to form ‘the bone yard’. To begin the actual game, the player with the highest double will go first. That player must lay their double face up on the playing surface and then play will continue to the left. 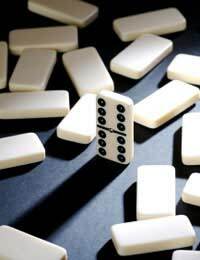 The next player should play a domino that matches the previously laid tile. This style of play continues, with the next player matching the tile at either end to continue. The game progresses clockwise in this way and any doubles should be laid at a right angle to any other dominoes that are played. If a player is unable to make a play, then they should ‘knock’. By ‘knocking’, which is usually signified by tapping on the table, a player is saying they can’t match any of the open tile ends on the table. This means they then have to take one domino from the bone yard and see if they can play that. If they’re unable to play it, they should add it to their hand and take another tile from the bone yard. If they’re unable to play this one, they keep it and take yet another tile. In some variations of block and draw, there’s no limit on how many times you can continue to pick up dominoes from the bone yard. In many games, the limit is three times, at which point the next player is due their turn. If there are no tiles left in the bone yard, a player must simply pass and the next player at the table will take their turn. Winning the game of block and draw dominoes is fairly easy. Any player who manages to get rid of all their tiles first wins or play can continue until there are no more dominoes left to be played. If this is the case, the player with the least number of tiles wins the game. You can also play block and draw dominoes by scoring points to win. Rather than simply awarding the round to the winner, you can get all the losers to count up the remaining spots left on all their tiles. This score can then be given to the winner and the first person to 100 is the overall champion. There are other variations on scoring, with some people preferring to play the ‘blocked’ game where the person with the lowest total wins. To play this, the winning player takes their score and subtracts it from each of the other players scores, then adds the two totals together to get an overall score. You can alter the scoring system as often as you want in block and draw dominoes, the main aim is to have fun and learn all about the game.